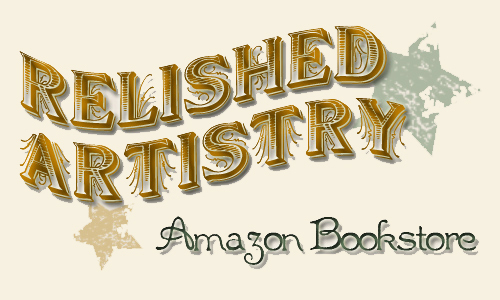 Relished Artistry Books and More--Click Here! When clicking the link above, you'll be taken to an Amazon Associate storefront of suggested reading materials. By purchasing any of the books and other items included on those pages through this blog, you will support the Relished Artistry blog and assist with bringing you future posts that contain helpful guidance, tutorials, thoughtful insights, and other interesting tidbits! All you have to do is click on the book or item you find interesting, and you'll be taken to Amazon's checkout system just like you would at their own site. I think my "cut" is 4% of the purchase price. The books I've listed are all in my own collection--I've used them and I trust them. I wouldn't recommend anything I haven't read myself! So I can say, wholeheartedly, that I stand by the books and other items I've selected for my little storefront. If you have a book you'd like to recommend to me, let me know and I'll add it to my reading list for the future!